The debate on buying a home vs. renting a home is a heated one. #1. Your home is like a piggy bank. When you buy a home, you have to make your monthly mortgage payments. And every time you make those payments, you’re increasing the amount of equity you have in the home. When you build up enough equity, you’ll likely eventually make money on your home, should you decide to sell it (this will also depend on the value of your home when you try to sell it). You could also borrow against the equity you build up in the home down the road, allowing you to borrow money for home renovations, paying off debt and many other things at a significantly lower interest rate. Your monthly rental payments, on the other hand, don’t do you any good. No matter how many times you pay rent, you’ll never be able to sell the home or borrow off of it because you don’t own it. A lot of people say that renting is akin to throwing away money every month, and while that’s not strictly true, it’s also not far from the truth from this perspective. #2. You’ll typically pay about the same for a house payment as you do for rent. A lot of people don’t even try to buy a home, believing that they can’t afford a monthly mortgage. However, it’s important to realize that, in many cases, you’ll probably end up paying about the same for your house payment as you do for your rent. This is especially true as renter’s markets are heating up all throughout the United States, and in fact, in 42 states, mortgage payments are actually cheaper on average than rent! Of course, buying a home is more than just making monthly mortgage payments. You also have to pay to maintain the home, and you shouldn’t overlook the many expenses you’ll have to cover initially, including the down payment, closing costs, appraisal fees, etc. However, as far as monthly payments are concerned, house payments are comparable to rent, if not a little less. #3. You’ll cash in on the tax benefits. Come tax time, homeowners enjoy far more tax benefits than renters do. Homeowners can deduct both property taxes and mortgage interest when they file their returns every year. These deductions reduce taxable income, saving homeowners billions of dollars in income tax every year. In fact, in 2016, homeowners saved approximately $35 billion because of property tax deductions alone. When you rent, there are fewer things that can be deducted from your taxable income, making it more likely that you’ll break even with or even owe Uncle Sam on tax day. And since monthly mortgage payments and rent are typically about the same, the ability to deduct property taxes and mortgage interest helps to make buying a smart financial decision. #4. You won’t have to worry about your monthly payments going up (if you have a fixed mortgage). According to CNBC, the cost of rent rose 2.8 percent to an average of $1,445 over the past year, which is the fast pace it’s risen since 2016. Because of rising housing prices, a lot more people are renting for longer, and landlords and property managers have been taking advantage of that fact by raising rent prices. Renters are completely at the mercy of their landlords and property managers. Once your lease is up, it’s completely up to the landlord or property manager to determine how much rent you owe if you decide to keep living there. This means that a home that was once affordable could no longer be in your budget from one day to the next. When you own your home — and you have a fixed rate mortgage — in general, you never have to worry about your monthly payment going up, except in the event that property taxes go up, which may cause only the escrow portion of your payment to increase. Not only that, but if you decide to pay a higher amount to the principal, you’ll pay off your mortgage sooner, which lowers the amount of interest you’ll pay over the life of the loan, and eventually, you’ll have a smaller payment or no payment at all apart from taxes. #5. You decide what you want to do with your home. 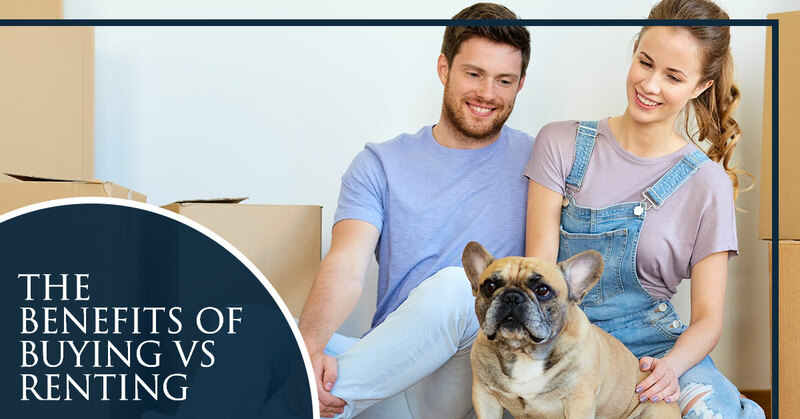 We’ve touched on a lot of the financial benefits of homeownership in this blog, but there’s one huge benefit that needs to be discussed — the ability to do what you want with your own property! Of course, you may be limited if you live in a neighborhood with a homeowner’s association, but for the most part, when you own a home, you can do whatever your heart desires to it. Want to paint your living room Pepto-Bismol pink? Go for it! Want to let five dogs and four cats take over your house? No one can tell you can’t have pets! Want to replace that ugly bush in the front yard with pink flamingos? It’s completely up to you! Although there are many benefits of buying a home instead of renting one, that doesn’t mean that buying is the right option for everyone. If you’re unsure about whether buying or renting is right for you, or you’re ready to start finding the right home loan for your needs, contact the experts at Patriot Home Mortgage today! We offer a variety of loan types, including the ever-popular FHA loan.